If life is full of wonder, then travelling is one of the great parts of it. Travelling is such a mission where knowledge follows in every step, where excitement remains with us as constant companion. In fact, a traveller is an explorer of his own life box. Travelling offers a chance to look beyond the margin of life. I got such an opportunity to cross my door of knowledge in the last April of 2018. It was a worth visit to a knowledge house in Springfield, Boston, USA. It was an exciting tour to a dictionary house. I should share here that it was my first visit to a dictionary house and that is why excitement was more than that of my other mates. I was totally thrilled and waiting for a blast. The day was 6th April and weather of Massachusetts was quite favourable. We had started our journey from the hotel in the morning. The sun was smiling on the window of the bus while it was moving forward. I set my eyes outside. Rows of trees without leaves were disappearing with the twinkling of eyes. I kept my open eyes with wonder. The bus was running with some crowds of my friends who came from thirteen other different countries. 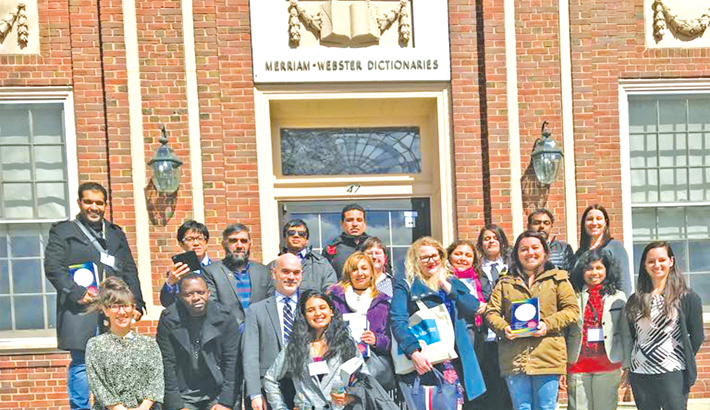 It should be mentioned here that I made this journey to a dictionary house as part of my tour to USA as a participant of International Visitors Leadership Programme which is popularly known as IVLP as well as it is the most prestigious exchange programme of US Embassy. After two hours of bus journey, we reached Springfield where the greenery beauty of Springfield welcomed us. Though the sun was shining brightly on that day, the cold with strong wind was blowing strongly. The sunny weather was full of coldness. I was trying to match that sunny day with our sunny days here in Bangladesh. It was the Merriam-Webster's Dictionary house. Here, I would like to share that Merriam-Webster's Advanced Learner's English Dictionary is the most popular and oldest dictionary. It was first published in1831. We got down from the bus at the very close to door of the Merriam-Webster's company office. The officials of the company welcomed us with their sweet smiling faces. The ancient look of the office caught my eyes with first sight. I was wondering with an excitement. My heart started ringing. I was looking here and there with new enthusiasm. We sat together for a formal introductory meeting. The editor of the dictionary Mr. Stephen J. Perrault delivered the welcome speech. He shared the long journey of the Merriam-Webster dictionary. Then he reflected on the techniques of using the dictionary. At the same time, different features of the dictionary were discussed. We came to know that about 100000 entries from all major areas of interest, including popular culture, business, sports, science and technology were included in the present issue. Their focus on choosing entries was to include the language that people are most likely to need and meet in their daily lives. The staff members of the company also discussed how to use this dictionary in the classroom and online resources for teachers and English language learners. After that session we enjoyed the lunch with various flavor. In fact, lunch table was a wonderful opportunity to exchange views and opinions. I did not miss that opportunity. We talked with the staff members and other guests and shared English teaching-learning experience from different perspectives. After lunch we spent some time with fun activities like spelling bee. Last but not the least, our long cherished moment came, editorial tour! The editor of Merriam- Webster's Dictionary and other staff members took us to the different floors. I was amazed at seeing the way of preservation of words. There were thousands of boxes for the entries of the dictionary. The small, wooden boxes were carrying the history of the words, such as, changes of spelling, meaning as well as application etc. I was listening to the officials with an enchanted mood. They described how they document the entries, edit and preserve. I found some entries hand written. The beautiful decoration of the rooms attracted us. After that, the staff guided us to another room. We were astonished with the calm and quiet atmosphere of every room. There, the authority of dictionary house displayed some oldest editions of Merriam-Webster's dictionary. I touched the ancient pages and my joys crossed boundaries at that moment. How exciting was that moment of touching the pages of 40/50 years ago! I was really astonished at seeing the art of their preservation. The earlier editions were set in the shelves according to the chronology. In fact, everything was systematic. The most beautiful part of that editorial tour was that the editor along with his team was always answering our questions and trying his level best to meet our queries. We returned from the Merriam-Webster Dictionary house in the late afternoon with lots of experiences and memories. I felt myself lucky enough to be able visit such a place. That’s why I always say, there is no alternative to experiencing life. Teaching is such a job where you need to renew yourself every day. The writer is an Assistant Professor, Dept. of English, Sylhet International University.